A little-known and not often used piece in the Queen's collection, this brooch uses a stone that she doesn't frequently choose: opals, black opals with gold specifically, in the design of a spray of flowering gum. By their very nature, the opals generate an array of colors, particularly when viewed at different angles. 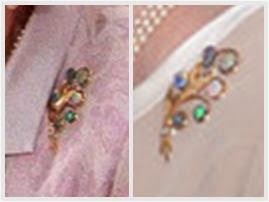 The brooch comes from Australia - not surprising, as this is their signature stone. It was a wedding present to the Queen (Princess Elizabeth, as she was then) in 1947 from the Returned Sailors', Soldiers' and Airmens Imperial League of Australia. The official wedding gift list notes that the brooch's casket bears the badge of the league in gold. 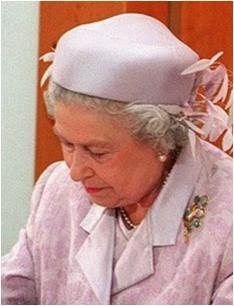 The Queen appropriately wore the brooch during a visit to Australia in 2000 and it has made a couple recent appearances, though it is still a rare brooch to see in use. Thanks to commenter adca for additional appearance information, and to Gill for confirmation!